Lamination stands for the bonding of two optical elements using an adhesive (Optical Clear Adhesive Film). This method is particularly suitable for compounds based on a rigid and a flexible element. 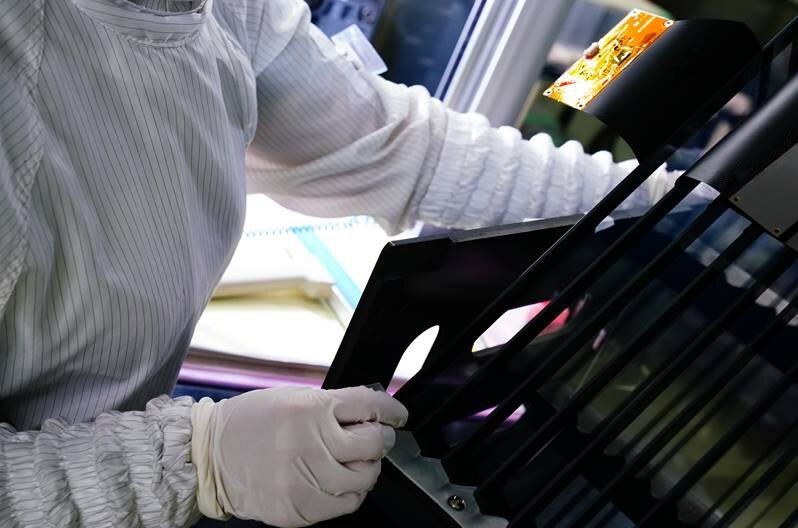 This process is used to laminate a PCap film sensor to a cover glass. Compared to optical bonding, this is a simpler process step, but certain factors in the process of PCap lamination must be met to achieve good optical transmission, longevity, temperature and UV stability. Furthermore, it must be ensured that the PCap touch foils are not stressed in the process in order to achieve optimal touch performance later in your application. To meet these requirements, we have established customized lamination and autoclave processes. The production takes place in the clean room. Furthermore, functional films, such as UV and infrared filters can be laminated into the stack-up. It is also possible to produce laminated safety glass based on a glass / film / glass structure for outdoor applications.